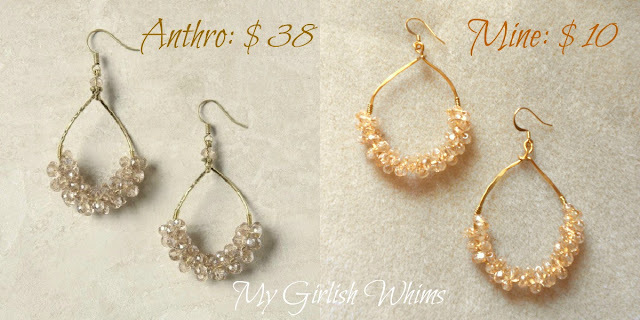 Anthropologie makes such gorgeous jewelry - I love their style but NOT always the prices on their pieces! 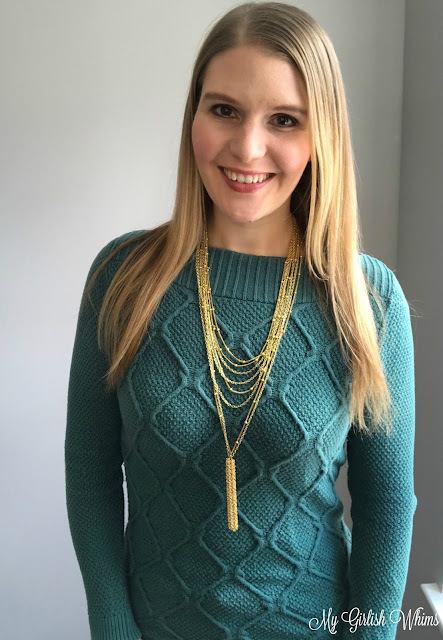 Today I'm going to show you how to knock-off this Bayla Layered necklace that originally retailed for $68 dollars only about $12! 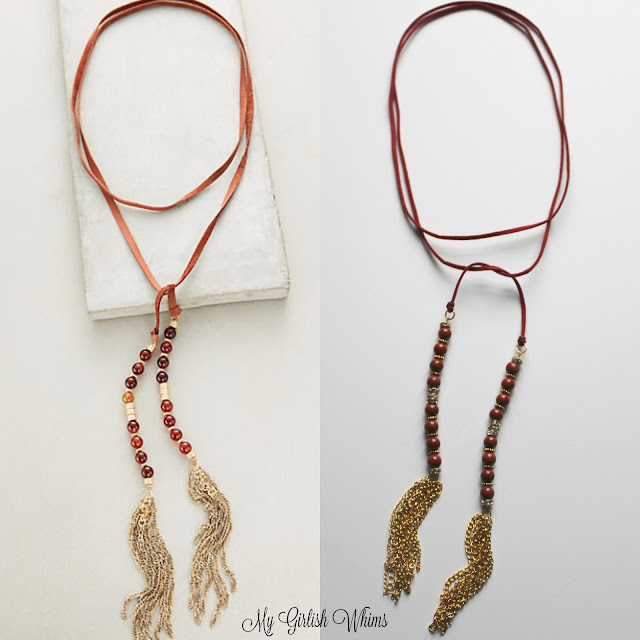 If you like this necklace make sure you check out the bottom of this post for where I have linked up all my other Anthropologie knock-offs! 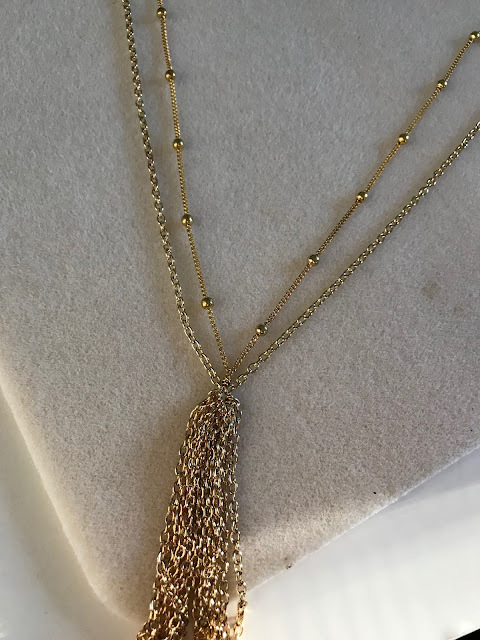 This is such a great neutral necklace - it's made using only two different types of gold chain so it is delicate enough to coordinate with most outfits while still making a statement! 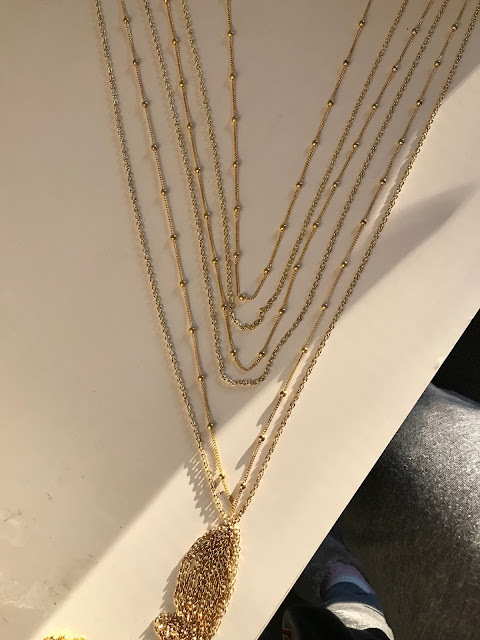 For this necklace you will need two different kinds of gold chain (preferably one small basic cable chain version and a cable chain version with gold balls. Mine both came from Cousin Corp.), gold wire, 4mm gold jump rings, a lobster claw clasp and 6mm jump ring, needle nose pliers, wire cutters and round nose pliers. 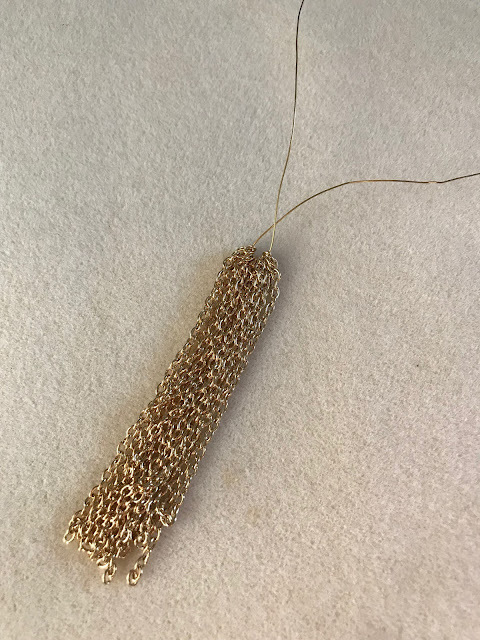 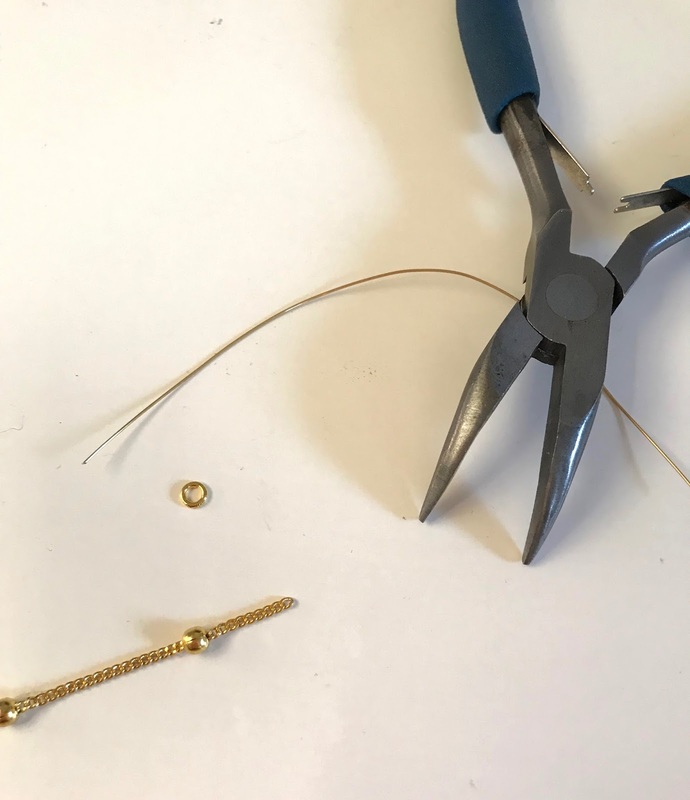 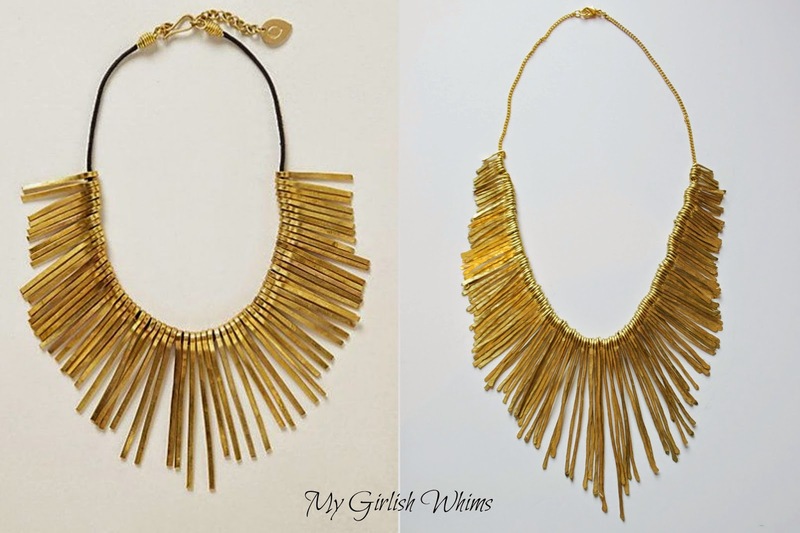 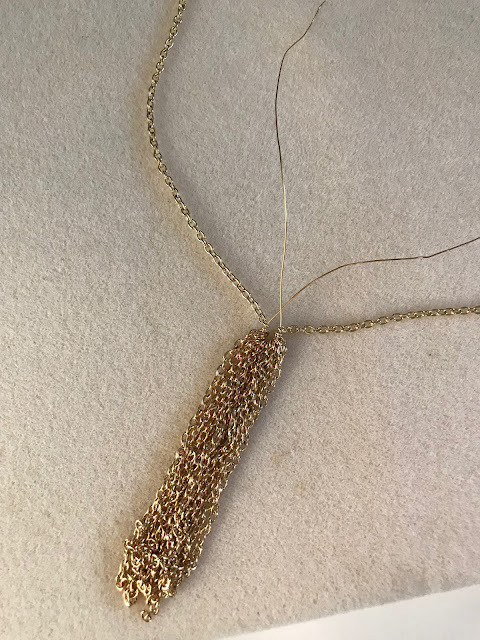 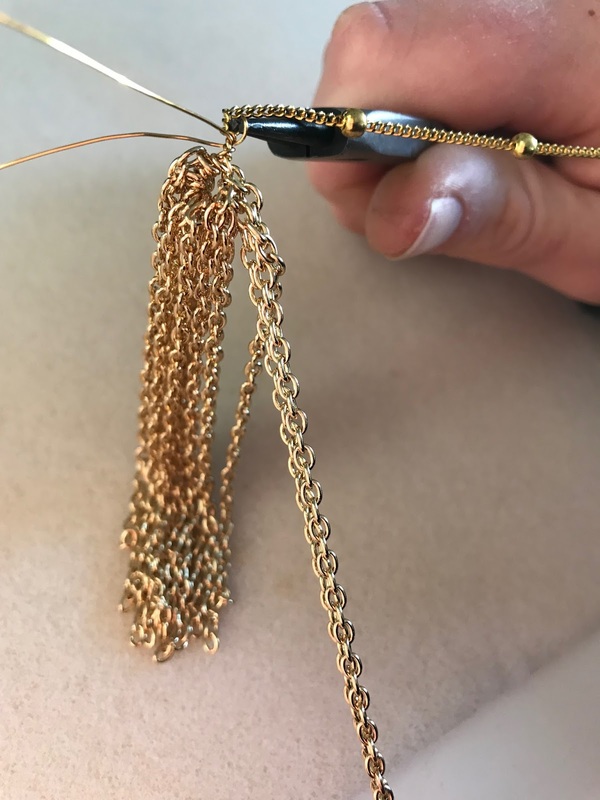 Form the tassel portion of the necklace by cutting multiple lengths of the basic gold chain about two inches long each using wire cutters. 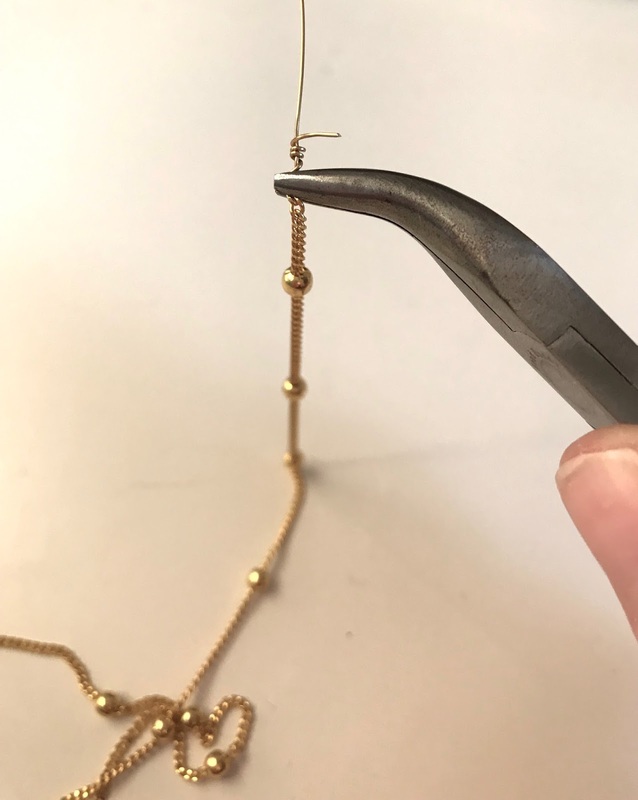 One trick to cut the same length of chain for multiple strings is to string the chain onto a spare head pin and measure each length to a previously cut piece that way. 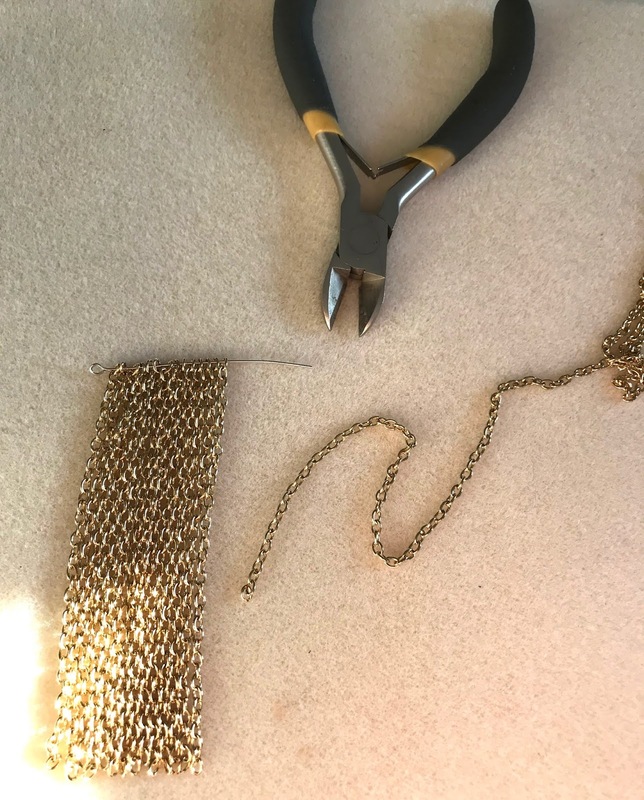 Cut two more pieces of basic chain to be around 10-12inches each depending on how long you want your finished necklace to be. 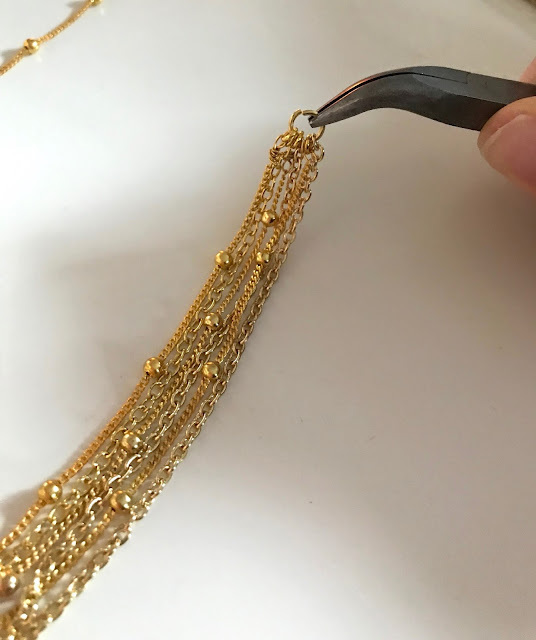 These will be the longest pieces of chain that make up the necklace. 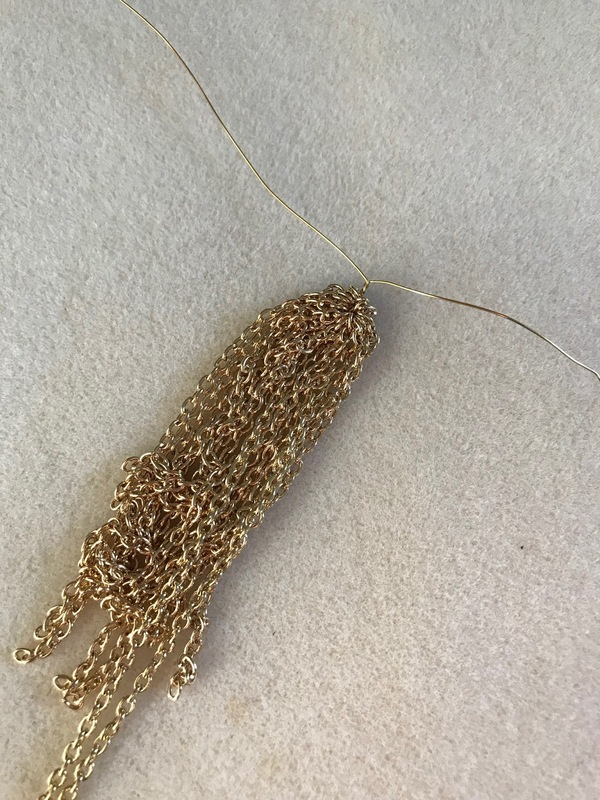 String one on to each side of the gold beading wire. 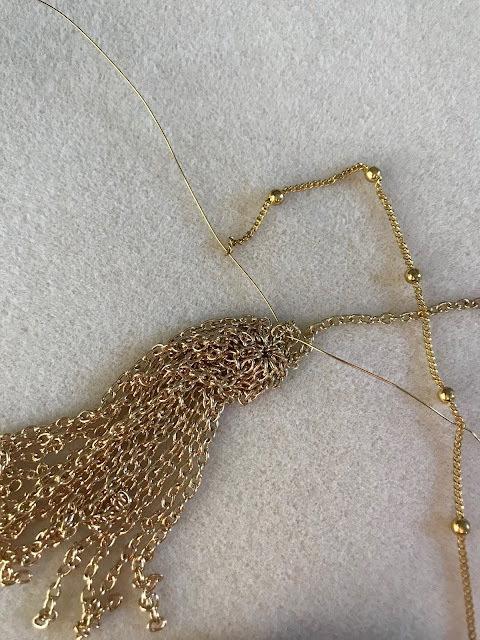 Next, measure a couple more strands of the basic cable chain and ball cable chain in decreasing lengths from your two longest strands on each side. 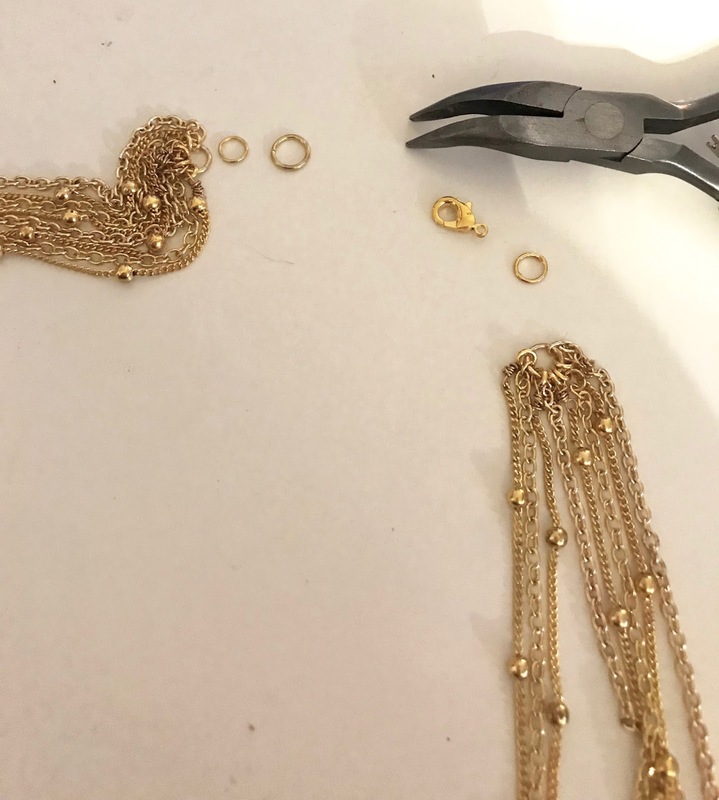 Cut each piece of chain using wire cutters to the desired length. 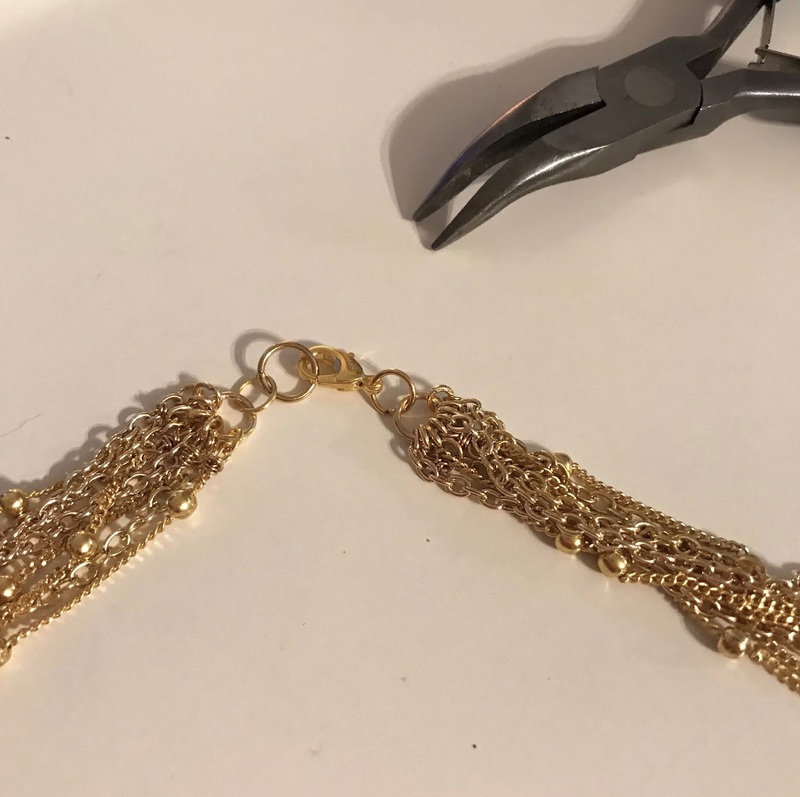 My basic cable chain was large enough to just use a jump ring to attach the ends of the chain to a clasp at the base of the necklace, but the chain of the fancier chain was too small for a jump ring so I had to wire wrap a jump ring onto each end. Trim off any excess wire using wire cutters and then your chain is ready to be attached! Do this for any end of your chain that isn't large enough to just regularly be strung onto a jump ring. 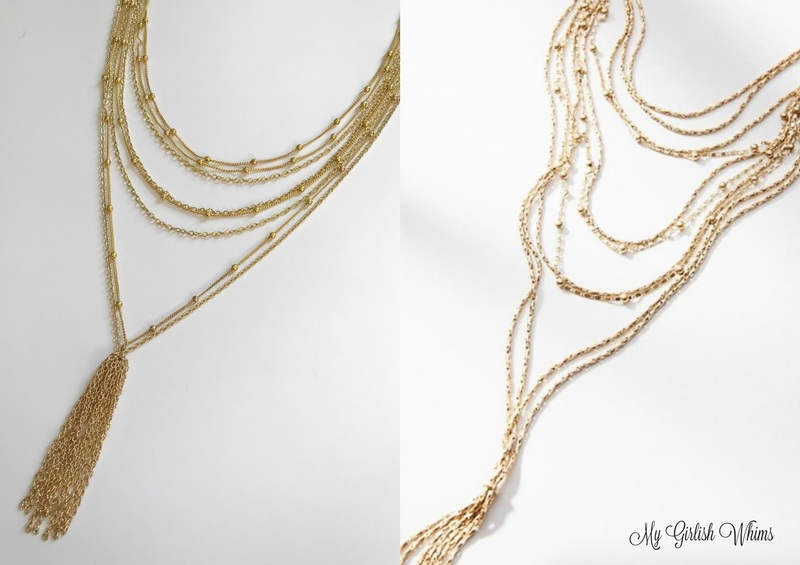 Arrange all of your chains in length order and then string them onto a 6mm jump ring. 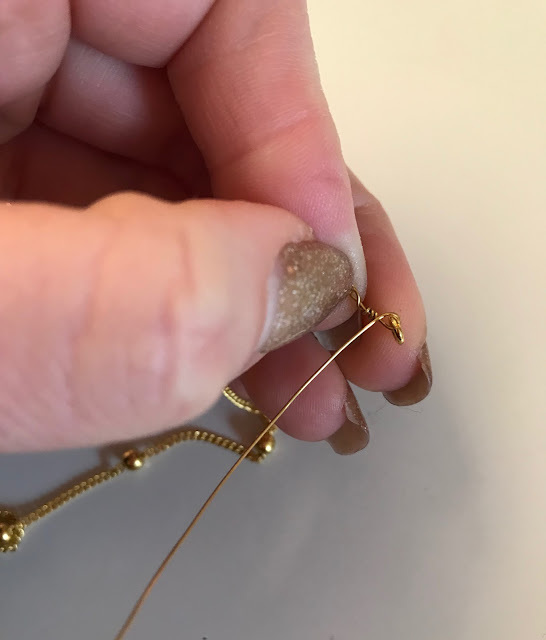 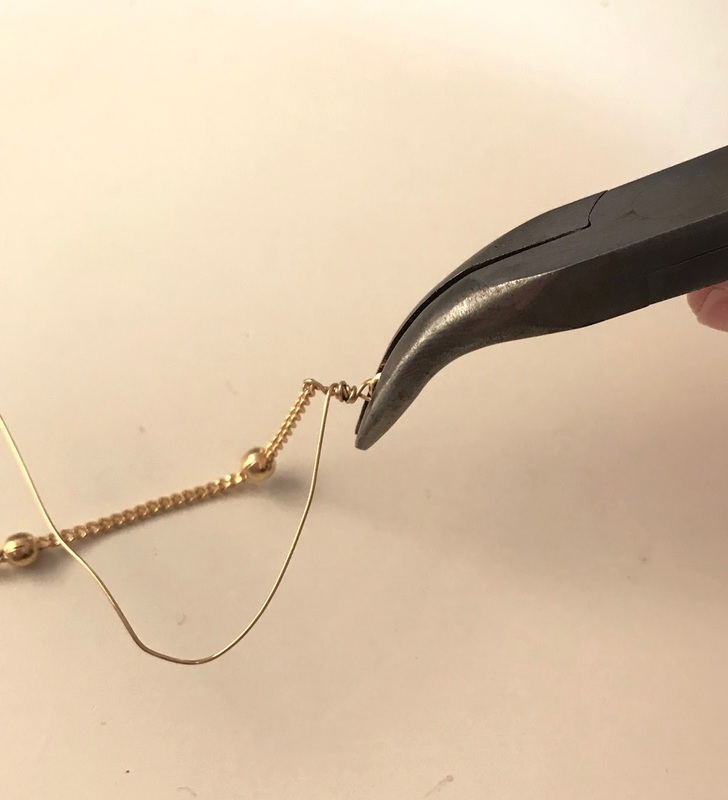 Attach a clasp to the end of the necklace by using needle nose pliers to attach an extra jump ring on each end and then add a lobster claw clasp to one end and another jump ring to the other. 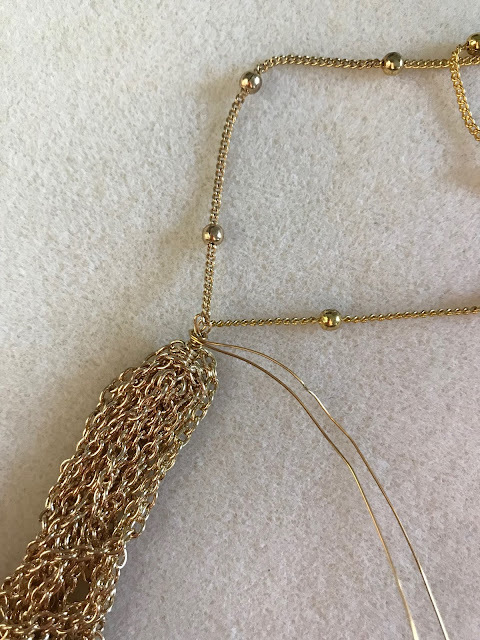 After everything is connected, your necklace is good to go! 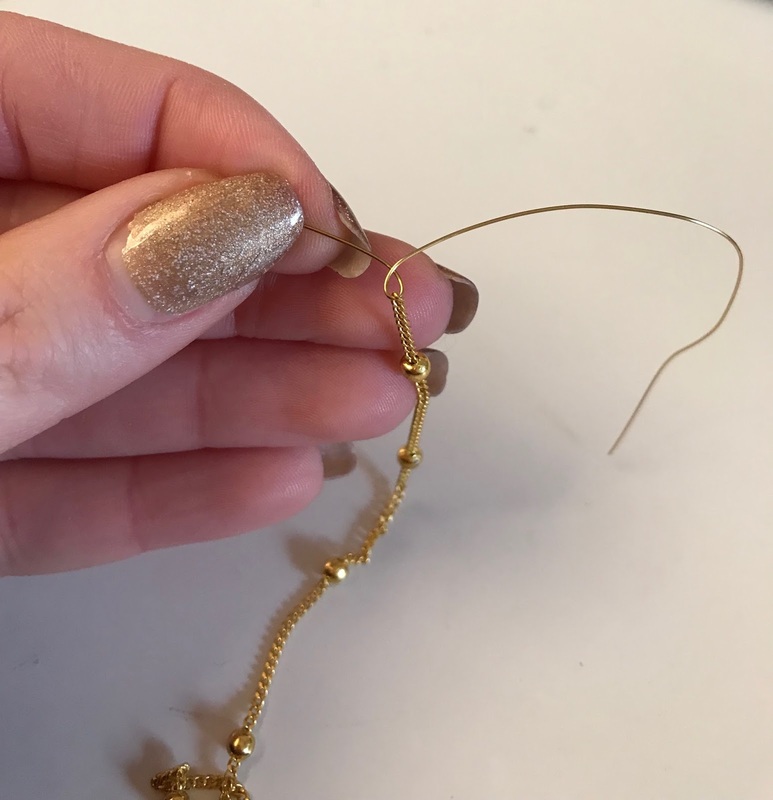 I'm starting to build up an inventory of my handmade jewelry to eventually start selling it again, but I don't think I'll be able to part with this one. 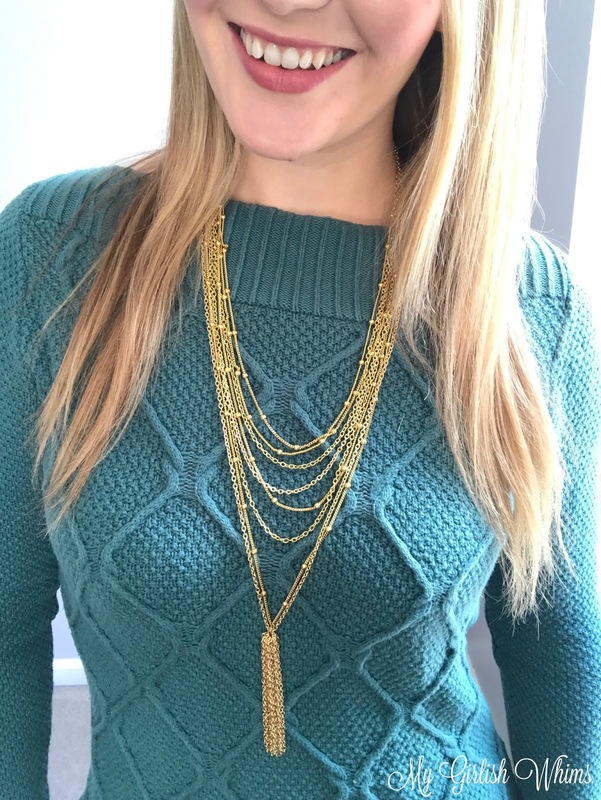 It's just so cute and can coordinates with so many different outfits! 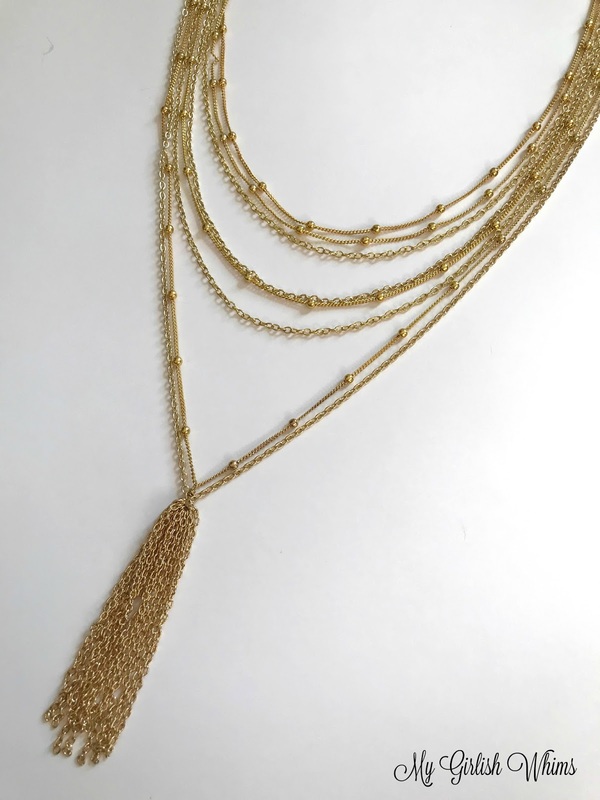 I feel like I'm always looking for a long, neutral statement necklace to jazz up a boring outfit and this is the perfect necklace for that. I guess I could just make another one to add to my inventory...I've got the technique and measurements down now so I should be able to whip up another one pretty quick! Is this kind of necklace something you would try making? 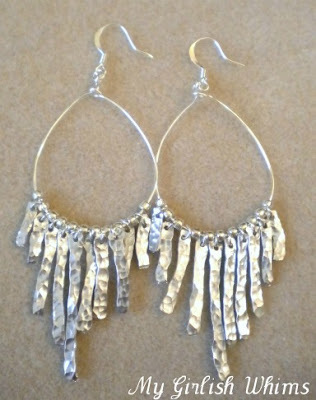 Or are you sticking with the anthro originals? 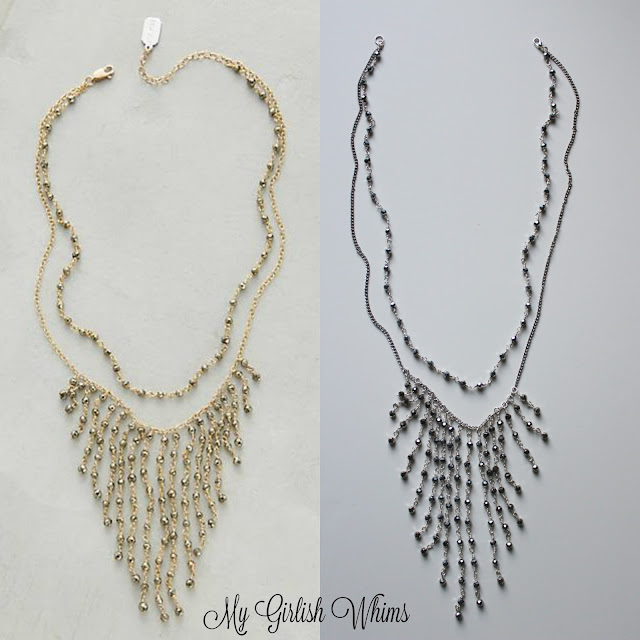 I'm not really into Anthro jewelry, I like more delicate styles. 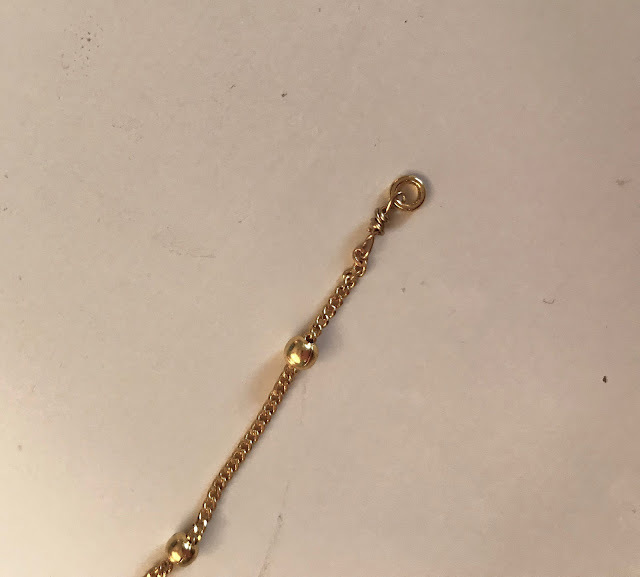 More vintage-y. 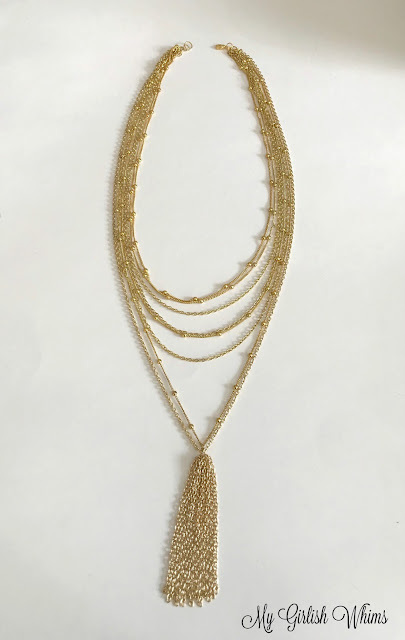 But, this is a good basic that I'd definitely make as opposed to paying $68.00 for plated costume jewelry. 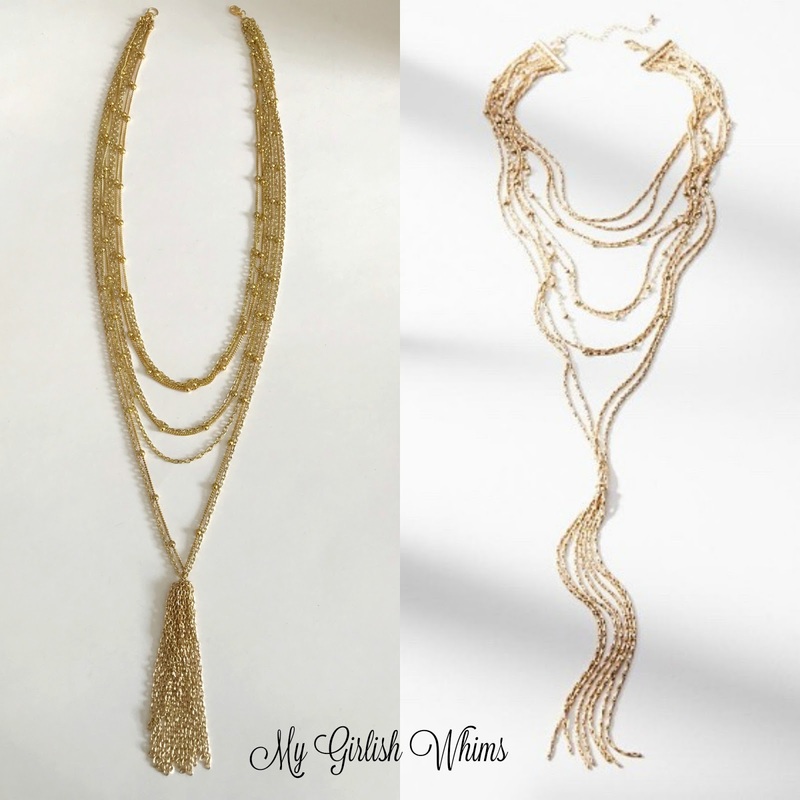 I just wondered why you stopped selling your jewelry, & why is now the right time to start again? 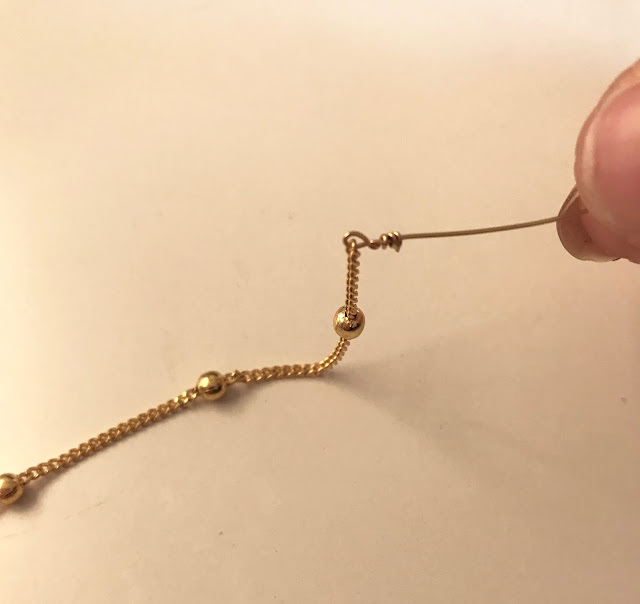 Glad your life has calmed down.